In October, Dr. Vilma Navarro-Daniels, associate professor of Spanish, was invited to become a member of the international group of research formed by scholars from both Universidad Metropolitana de Ciencias de la Educación (UMCE) and the University of Brasilia (UnB). Now, the School of Languages, Cultures, and Race, WSU, will have a presence in this association that has been active for nine years. Read more about what she did as a member of this international group. Doctoral Candidate Lucia Soriano, Associate Professor Dr. Lisa Guerrero, Associate Professor Dr. Ana María Rodriguez-Vivaldi, and Doctoral Candidate Nicholas D. Krebs became members of a National Endowment for the Humanities Next Generation Grant project called “Reinvisioning the 21st Century Land-Grant Ph.D.” The project is about rethinking graduate education at land-grant institutions. Dr. Todd Butler, associate dean for CAS faculty affairs, is the principal investigator of the project. Dr. Lisa Guerrero, associate professor of Comparative Ethnic Studies, became a member of the Provost’s Leadership Academy this year. PLA recognizes outstanding faculty on their campus and provides the faculty with a training program to expand their confidence, leadership skills, and University network. During her tenure in PLA, Guerrero will lead the UCORE Diversity Committee, establishing mechanisms and processes to assess UCORE courses with Diversity designation and developing resources for instructors who currently teach, or plan to teach, UCORE Diversity courses. Dr. Carmen R. Lugo-Lugo, director of SLCR and professor of comparative ethnic studies, was a keynote speaker at this year’s University Convocation. In Beasley Coliseum, she told 2,800 students about her journey at the University of Puerto Rico and how it led her to achieve her master’s and doctoral degrees at WSU. Lugo-Lugo recalled struggling with decisions about her future after her undergraduate education. She told the new WSU students at Convocation that it’s okay to not know what you want to do because it allows you to explore various options. Read more about her speech. Dr. David Leonard, CES and American studies professor at WSU, and Dr. Kishonna L. Gray, assistant professor at the University of Illinois at Chicago, co-edited “Woke Gaming: Digital Challenges to Oppression and Social Injustice.” Their book describes how gaming illustrates the many cultures of systematic exploitation and oppression. The Guardian named it one of “Six of 2018’s best new books about video games.” According to The Guardian, “Woke Gaming seeks to push readers to recognize persistent inequalities, as well as those who struggle for change within both our virtual worlds and in our everyday communities.” Read the article of recognition. 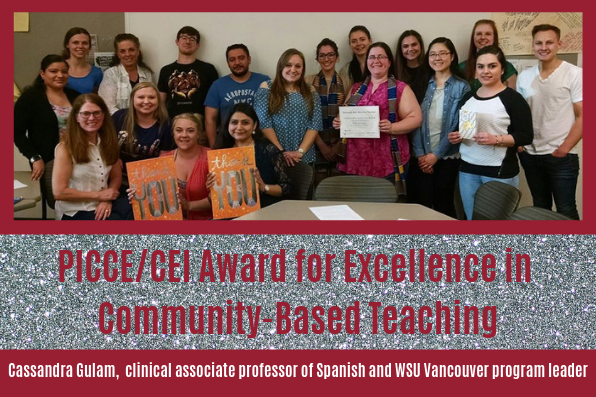 Cassandra Gulam, clinical associate professor of Spanish and WSU Vancouver program leader, was awarded the “PICCE/CEI Award for Excellence in Community-Based Teaching.” In spring 2018, as part of the inaugural Community Engagement Faculty Fellowship established by WSU Center for Civic Engagement, Gulam designed and taught a version of Spanish 362, also known as Spanish for Medical Professions. It incorporated reflective community engagement practice, as well as hands-on Spanish interpreting experience, through partnerships with three safety-net clinics in Clark County. Learn more about Gulam’s Spring 2018 work. 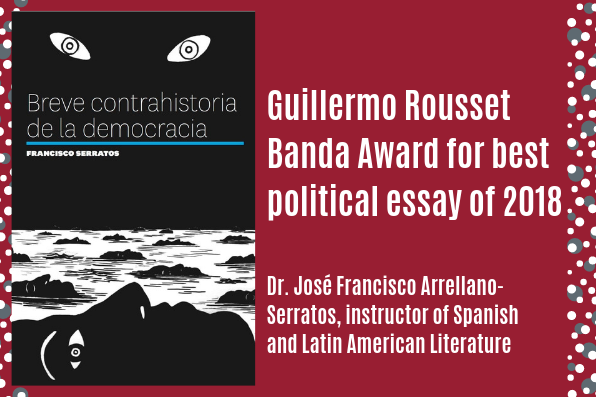 Dr. José Francisco Arrellano-Serratos, instructor of Spanish and Latin American Literature, won the Guillermo Rousset Banda Award for best political essay of 2018 granted by the Universidad Autónoma de Ciudad Juarez (The Autonomous University of Ciudad Juarez) for his book Breve contrahistoria de la democracia (Brief Counter-History of Democracy). In his book, he describes how some democratic practice has connections to slavery, inequality, racism and war. The book details the system of democracy that seems to have condemned people to life in exploitation, poverty, and inequalities. In November, Dr. Vilma Navarro-Daniels, associate professor of Spanish and American Studies, received the Marianna Merritt and Donald S. Matteson Distinguished Professorship in Foreign Languages and Cultures from the WSU College of Arts and Sciences. This professorship will provide funds to further her teaching and research. She plans to use the funds to support her research and education projects with colleagues at Universidad Metropolitana de Ciencias de la Educación (UMCE) in Santiago, Chile. She also plans to use the funds for her personal research in Spanish and Chilean film, literature, and popular culture products. Read more about her achievement. On Nov. 14, Kayo Niimi, instructor of Japanese, received the United Greek Council’s Outstanding Faculty Member Award at the 2018 Arete Awards. The awards were presented by the WSU Center for Fraternity and Sorority Life. At the Leadership and Engagement Awards of Distinction (LEAD) ceremony, four of our school’s members received awards. Dr. Ana María Rodríguez-Vivaldi, associate professor of Spanish, American Studies, and Film Studies and associate dean of Student Affairs and Global Education, College of Arts and Sciences, and three students received the 2018 President’s Award for Leadership from the WSU College of Arts and Sciences. Shanelle Briggs, class of 2018, majoring in Spanish and Basic Medical Sciences; Abu Kamara, class of 2018, majoring in Comparative Ethnic Studies and Political Science; and Omar Zaragoza, class of 2019, majoring in Comparative Ethnic Studies and Political Science were the student recipients of the award. The award was based on exemplary leadership in the community and engagement with WSU students. Read more about the award recipients within College of Arts and Sciences. Each year, WSU recognizes all employees who have achieved a length of service award. In August 2018, the University began recognizing faculty at 5 years of service. When an employee reaches a milestone, they receive a letter of congratulations, a certificate of service, a lapel pin, and an award selected by the employee. This year the WSU President hosted the Fourteenth Annual Employee Recognition Reception to honor all employees who passed their milestone. We are excited to announce that six of our SLCR members have achieved a milestone! >> See all the WSU employee awards. 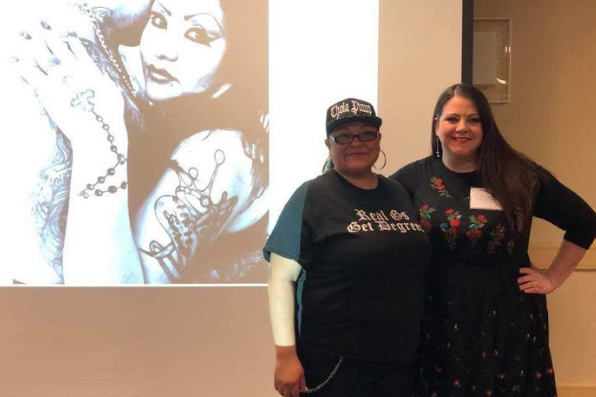 Doctoral Candidate Veronica Sandoval presented for two panels at the National Association of Chicana and Chicano Studies (NACCS) Conference in April. She presented “Chola’s Chismosa: Countersites of Resistance Through Chola Pinup’s La Chismosa: A Publication for Activist Cholas,” for the panel “Queer Pedagogy and Poetics Sin Fronteras: Chicanx Testimonios y Performance in the Classroom, la Calle, y la Comunidad.” She also presented “Chola Intergenerationality: Lessons for las Ovas that Remain” for panel “Intimacy as a Project for Survival: Migrant Precarity, Femme Gestures, and Queer Intergenerational Bonds.” In this image, Veronica stands with her co-presenter at the panel presentation. Sabine Davis, clinical associate professor of French, traveled to Martinique, France, to participate in the annual American Association of Teachers of French (AATF) convention in July. While there, Davis presented “Programme de français interdisciplinaire à Washington State University” (Interdisciplinary Program in French at WSU) and “L’Organisation Internationale de la Francophonie: origine, développement et perspectives” (International Organization of Francophony: origin, development and perspectives). In October, she went to Cheyenne, Wyoming, to present at the annual Rocky Mountain Modern Language Association (RMMLA) convention, where she presented in the Pedagogy session on her capstone course, French Culture Through Wine. Dr. José Francisco Arrellano-Serratos, instructor of Spanish and Latin American Literature, presented a paper at the XLII IILI conference in Bogotá, Colombia, in July. Associate Professor Dr. John Streamas presented his paper, “The Overselling of Higher Education to People of Color” at the Race and Pedagogy conference, which was hosted at the University of Puget Sound in Seattle in September. 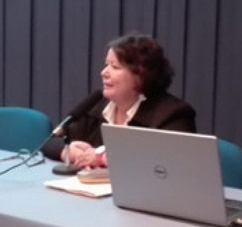 Dr. Vilma Navarro-Daniels, associate professor of Spanish and American Studies, was invited by the Dean of the College of History, Geography, and Letters, at the Metropolitan University of Sciences of Education (UMCE), Santiago, Chile, to give the keynote address at the 21st International Congress in the Humanities in October. Her presentation was titled “Race, Gender, and Memory in New Chilean Cinema.” Read more about this conference. María Elena Lee-López, adjunct instructor of Spanish, participated in an electronic poster presentation, “Student-Made Common Craft Videos Improve Oral Proficiency,” at the ACTFL conference in New Orleans in November. Doctoral Candidate Nicholas D. Krebs attended the annual meeting of American Studies Association (ASA) in Atlanta, Georgia, in November. At the meeting, Nicholas participated in four panels. He was the interviewee for the Mock Job Interview at the “Friday Breakfast Forum and Mock Job Interview” panel. That panel illustrates a mock interview between faculty members who have served on search committees and an advanced graduate student who is navigating the job market. The panel may help people who are preparing for the job market or already in the job market. In “No Ban, No Paywall, Open Access For All: The Ethics of Open Access Publishing” panel, he was a discussant who was sponsored by the Students’ Committee. At this panel, he represented graduate student interests in open access publishing. In the next panel called “Academic Labor, Austerity, and Authoritarianism,” he was a panelist representing the Students’ Committee. This panel was co-sponsored by ASA Critical Ethnic Studies Committee and the ASA Marxism Caucus. He discussed the National Endowment of the Humanities Next Generation Grant, which he is a member of. Lastly, Krebs organized the panel “Generational Gifts: A Convivial Celebration of Mentoring, Scholarship, and the Future of American Studies.” This event was sponsored by the ASA Committee on Gender and Sexuality Studies, the ASA Minority Scholars Committee, and the ASA Critical Ethnic Studies Committee. At the panel, people ate a vegan food from a brunch buffet while several awards were presented by the committees. In addition to this, there was a mentor and mentee meet and greet, to facilitate new networks of scholarly exchange and professional development. Doctoral Candidate and TA Casey Ratto was recently accepted to present at the 2019 National PCA/ACA Conference in Washington, D.C.
Doctoral Candidate Lucia Soriano’s “Negotiating Popular Feminism in Freeform’s The Bold Type” paper was accepted to the March 2019 Society for Cinema and Media Studies conference. In Summer of 2019, Doctoral Candidate Lucia Soriano and Doctoral Candidate Nicholas D. Krebs will be visiting professors at the Universität Passau/University of Passau in Germany. Nicholas will teach CES 209: Hip Hop Around the Globe for the University of Passau and an online version of CES 209 for our school. Casey Ratto, doctoral candidate, wrote the article, “Not Superhero Accessible: The Temporal Stickiness of Disability in Superhero Comics.” The article was published in Disability Studies Quarterly. Associate Professor Dr. John Streamas, published a review of Temporalities, by Russell West-Pavlov, in KronoScope 18:1. He also authored “The Real War That Got into the Movies: Eastwood and Spielberg in the Pacific” in The Films of Clint Eastwood: Critical Perspectives (University of New Mexico Press). It was edited by Mat Wanat and Leonard Engel. Streamas’s poem “My Blue Whale” was featured beside an artwork in the Inflatable Celebration exhibit, Third Street Gallery in Moscow. Dr. Vilma Navarro-Daniels, associate professor of Spanish, author of “Cathartic Fear, Television, and Memory: The Archives of the Cardnial,” wrote a research paper on Chilean TV series, Los archivos del cardenal, which was published as part of the book, Narratives of Fear: Terror in 20th and 21st Century Latin American Literary, Cinematic and Television Works (Peter Lang Publishing, New York). Her paper analyzes the representation of violations of human rights committed during Augusto Pinochet’s dictatorship and the role of Catholic Church in the defense of the victims and their families symbolized in the person of Cardinal, Raúl Silva Henríquez. This book was published by New York: Peter Lang Publishing, 2018. Her book chapter can be found from pages 129 to 142. Dr. Joan Grenier-Winther, Marianna M. and Donald S. Matteson distinguished professor of French, edited and translated two late-medieval French Amorous Debate poems. These poems included: La Belle Dame qui eust mercy and Le Dialogue d’amoureux et de sa dame. The poems were published by Modern Humanities Research Association in “La Belle Dame qui eust mercy and Le Dialogue d’amoureux et de sa dame: A critical Edition and English Translation of Two Anonymous Late-Medieval French Amorous Debate Poems” Volume 60. Read more about her publication. Dr. Carmen R. Lugo-Lugo, Comparative Ethnic Studies professor and director of SLCR, published an article in the Centro Journal. Her article was called “Getting to the Colonial Status through Sexuality: Lessons on Puerto Rico’s Political Predicament from Women Writers.” This article can be found on page 234 in the journal’s issue called “Revisiting Queer Puerto Rican Sexualities: Queer Futures, Reinventions, and Exclusions.” Read the article. Dr. José Francisco Arrellano-Serratos, instructor of Spanish and Latin American Literature, published his article “Los grados de la perversion: Ciencias morales de Martín Kohan y la inversión del orden” in the journal Confluencia. Revista Hispánica de Cultura y Literatura. Doctoral Candidate Veronica Sandoval published her first peer-reviewed article, “Immigration, Surveillance, and Unaccompanied Minors in the Rio Grande Valley: Nepantla Praxis in the Works of Borderland Artist Celeste De Luna.” It can be found in 2018 El Mundo Zurdo 6, Aunt Lute Press, San Francisco, California. Also in 2018, Aída Hurtado featured one of Veronica’s poems in Hurtado’s “The Landscapes and Languaging of Chicana Feminisms” essay. Her poem is titled “My Reality is My Poetry.” Coming in 2019, Veronica plans to print “Playing Chola: The Discourse of Subjects and Subject-Selves” in a Routledge publication. 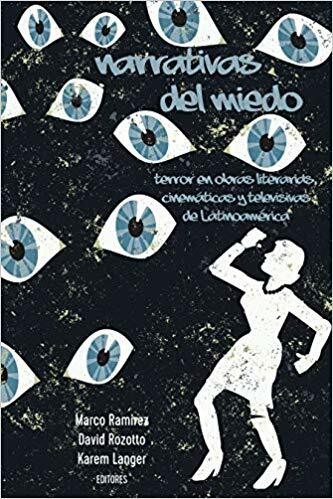 Dr. Vilma Navarro-Daniels, associate professor of Spanish, published “Suicide as a Form of Resistance: Sebastián Sepúlveda’s film, Las niñas Quispe” in the peer-reviewed journal, Letras Femeninas (Vo. 43, No. 2, pages 39-54). Her paper discusses the representation of women, race, and dictatorship in Sebastián Sepúlveda’s film. Based on real events, the film recreates the collective suicide committed by three sisters and members of colla ethnic minority. 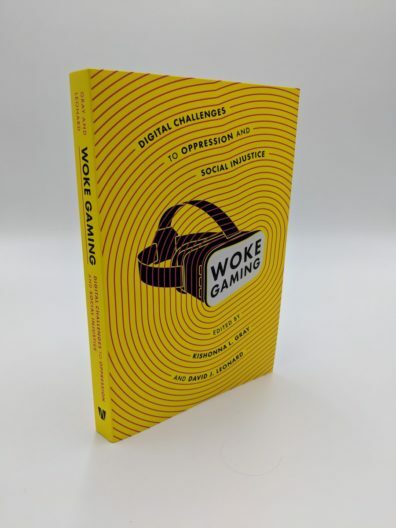 Dr. David J. Leonard, CES and American Studies professor at WSU, and Dr. Kishonna L. Gray, assistant professor at the University of Illinois at Chicago, edited the new book Woke Gaming: Digital Challenges to Oppression and Social Injustice was published. It describes how gaming illustrates the many cultures of systematic exploitation and oppression. Buy the book. Sabine Davis, clinical associate professor of French, authored “French Culture Through Wine: A Capstone Course,” which will appear in The French Review, Vol. 93.1. 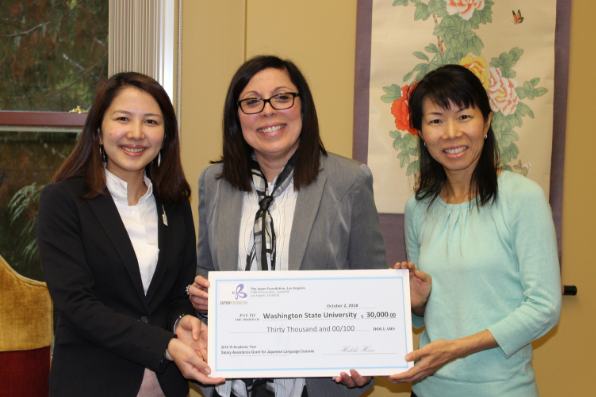 Japanese Instructor Kayo Niimi (right) and Dr. Carmen Lugo-Lugo, SLCR director and comparative ethnic studies professor, (center) accepted a $30,000 salary-assistance grant from the Japan Foundation, Los Angeles, presented by Yoko Yanagimoto. Niimi applied for the grant and has received three previous grants from JFLA: two for $1,000 and another for $700. The previous grants helped supply textbooks and other materials for her courses and funding for a community comedy performance by a world-renowned Rakugo artist. The new salary assistance grant will allow for a part-time teaching position of Japanese culture courses. It also will help foster new ways to expand students’ knowledge of Japanese history, culture, and language. This grant has created Japanese-specific culture courses that we haven’t been able to offer since Fall of 2016. Read more about this achievement. Veronica Sandoval, doctoral student in American Studies, was awarded the Arnold and Julia Greenwell Scholarship for Social Sciences and Humanities from the Graduate School at WSU. She also received the Chicana Caucus Student Scholarship at the 45th Annual Meeting of National Association for Chicana and Chicano Studies (NACCS).